Join us Saturday, June 16, for movie night at City Roots! 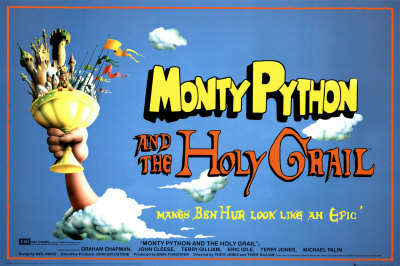 We’ll show Monty Python and the Holy Grail, beginning around 9:15 p.m. There will be snacks, water, and adult beverages for sale. Don’t forget to bring a chair or a blanket to sit on. RSVP here on Facebook. This is the third of a three part spring series, brought to you by Rosewood Community Council, Rosewood Merchants Association, and City Roots. Thanks for supporting our spring movie series! And special thanks to our great Rosewood neighborhood sponsors! The Big Lebowski at City Roots! Join the Dude this Saturday at City Roots! We’re showing The Big Lebowski, Saturday May 19, starting around 9 p.m.
Don’t forget to bring a chair or blanket to sit on. Adult beverages (including White Russians!) will be available. Perry’s Juices of All-Local Farmer’s Market fame will be there with lemonade and popcorn. This is the second of a three part spring series, brought to you by Rosewood Community Council, Rosewood Merchants Association, and City Roots. Mark your calendar for June 16 for the last movie. Thanks to our great Rosewood Drive and neighborhood sponsors! Join us Saturday, April 21, for a movie night at City Roots! We’ll show E.T., beginning a little after 8:30 p.m.
Perry’s Juices and Lemonade will be here with lemonade, cookies, and popcorn. Water and adult beverages will also be for sale. Don’t forget to bring a chair or a blanket to sit on. RSVP here on Facebook. This is the first of a three part spring series, brought to you by Rosewood Community Council, Rosewood Merchants Association, and City Roots. Mark your calendar for future movies on May 19 and June 16. This spring, RCC is partnering with City Roots and the Greater Rosewood Merchants Association to provide a neighborhood outdoor movie series at City Roots. April 21, 8:30 p.m., E.T. We’ll be selling snacks, water, and adult beverages. Be sure to bring a chair or blanket to sit on. See you there! Thank you to our generous Rosewood neighborhood sponsors!